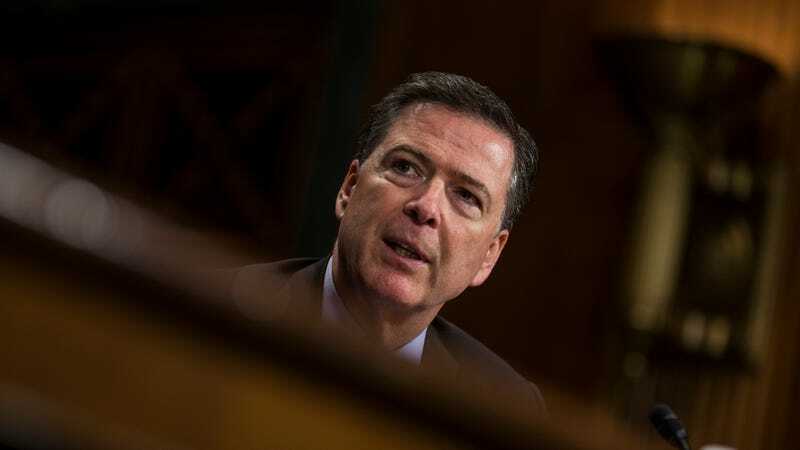 Fired FBI Director James Comey is set to testify before the Senate Select Committee on Intelligence on Thursday morning regarding whether or not President Donald Trump, a walking anorectal blockage, attempted to obstruct federal investigations surrounding Russia’s influence on the 2016 election. In advance of his testimony, his written opening statement has been made available online. In it, Comey recounts five separate encounters with Donald Trump, which range from awkward to inappropriate, and demonstrate several classic characteristics of an abusive or coercive relationship—including isolation, flattery, and threats. Comey also details the January 27 dinner—which turned out to be just the two of them—where Trump asked if he intended to stay on as FBI Director, since, after all, Comey had taken a lot of abuse during the election and many people wanted that job. He then said, “I need loyalty.” I replied, “You will always get honesty from me.” He paused and then said, “That’s what I want, honest loyalty.” I paused, and then said, “You will get that from me.” As I wrote in the memo I created immediately after dinner﻿, it is possible we understood the phrase “honest loyalty” differently, but I decided it wouldn’t be productive to push it further. The term—honest loyalty—had helped end a very awkward conversation and my explanations had made clear what he should expect. Later in the statement, Comey recounts a February 14 counter-terrorism briefing in the Oval Office. Trump, according to Comey’s recollection, excused everyone in the room, including Attorney General Jeff Sessions, Comey’s boss. Comey writes that immediately following the meeting, he reported the conversation to FBI senior leadership. Leadership resolved to keep the details of the conversation to themselves for the moment, and figure out what to do with it as the investigation moved forward. On March 30, Trump called Comey again to stress that the Russia investigation was a “cloud” that was making it hard for him to do his job. “He said he had nothing to do with Russia, had not been involved with hookers in Russia, and had always assumed he was being recorded when in Russia.” He asked Comey what they could do to “lift the cloud.” Comey called Acting Deputy Attorney General Dana Boente to report the call, but did not hear back from him. White House officials told reporters last week that Trump plans to live tweet Comey’s testimony—a typically presidential move that doesn’t suggest any insecurity or desire to intimidate on Trump’s part. The full statement, which is worth reading, is available here.